What's the best bbq thermometer - The BBQ BRETHREN FORUMS. I'm about to order a new WSM 22" and soon a 22" Weber PERFORMER kettle, I have a smoker with firebox from acadamy, got a good deal cause it had a few blemishes, couldn't walk away, lol. Any way the big smoker seems a lot of tending to and I don't mind, but I had the 2 above years ago and loved them, now I want to try again. I finally almost kinda sorta, have my wife convinced to get the 2 even though I have the big smoker. I guess I'm like a kid in a candy store, I wants them all, lol. PS one day I to will wear the BBQ Crown! I recon I'm getting old because I seem to like BBQ'n as my hobby and it don't yell back like the wife! You'll hear a variety of responses, but a lot of us use the Maverick Redicheck. It's range can be limited, but overall a decent thermometer. 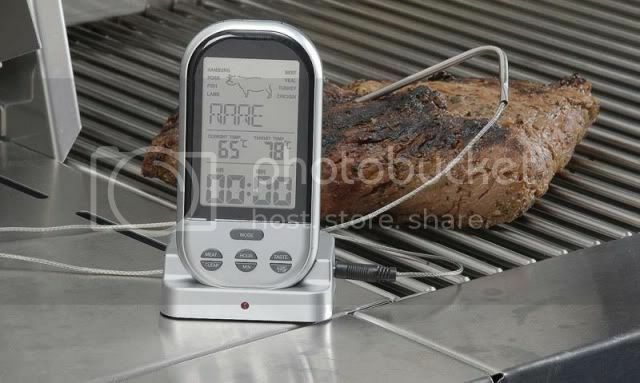 Has two probes, one for the smoker and one for the meat, and you can set upper and lower alarm limits for each. Also has a remote wireless receiver. The Maverick line is very good. Thermopens too !!! I use the Redi-Check and found foil wrapping the probe leads will greatly extend thier life .. especially at higher temp cooks. Hey....what's one of them run ya, Saiko? Also....is the wire to the probe(s) braided metal or does it have the plastic sheathing? Guess I could "google" huh? Truer words were never spoken. Mods lock the thread before it gets out of hand. $49.99 at Amazon. And the probe wires have braided metal sheaths. 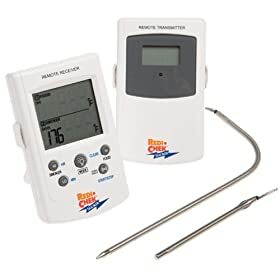 I bought a remote (wireless) thermometer called Smart BBQ for $16 at Wally World, imported by JLR Gear (www.jlrgear.com). Works great. Last edited by Old Hippie; 07-14-2009 at 10:04 AM..
BTW: Is that photo of 2 different thermos, or is one photo of some sort of cover? Couldn't tell by your Amazon link either......? Just curious. The one with the larger display is the remote sensor. When on it shows you food and cooker temps at the same time. The one with the smaller display is the one the probes plug in to. It alternates displaying between food and cooker temp. Long curved probe is for meat, short, straight one goes into a clamp (included) that fits on the grill grate to show cooker temp. Welcome, and from your post on drinking I see you make wise decisions, so I know you will end up with a BLUE Thermapen. Don't be misled by people trying to get you to purchase inferior colors such as Red, orange and such.